Having been born and raised in Iowa, it goes without saying that I was highly curious and ecstatic at learning that a fellow Iowan had written and directed a horror film not too far from my stomping ground. I have always believed that the desolate Iowa landscape, with its endless miles of cornfields, unsettling turn-of-the-century style farmhouses and barns, and quaint, picturesque non-industrialized small towns, contains a plethora of potential for the active imagination of a filmmaker interested in the horror genre. Low and behold the emergence of director Michael Paul and his wife, Anne, who wrote and stars in the ultra-low budget Roman’s Bride, the culminating result of both of their love and appreciation for the old-school style horror films, such as The Texas Chainsaw Massacre and Carrie. Certainly the first thing viewers will notice is that Roman’s Bride does not possess anywhere near the budget of these predecessors (even the low-budget Massacre). 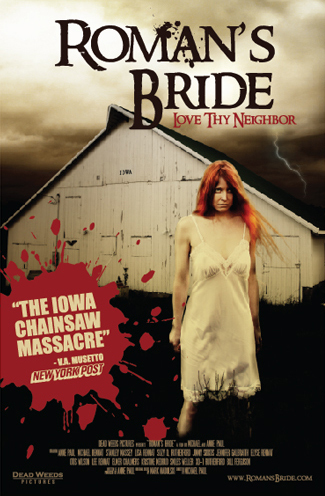 As the film begins, younger genre fans spoiled by big budgets and slick production values may be immediately turned off, as Roman’s Bride has a visual quality reminiscent of the countless direct-to-video slasher films that emerged in the 80’s in order to cash in on the success of films like Halloween, Friday the 13th, and Prom Night. However, what Roman’s Bride possesses that these films severely lack is heart. It is obvious that the Paul’s paid meticulous attention, despite their virtually non-existent budget, to creating a film that is an unsettling homage to the films that so heavily influenced them. Roman’s Bride opens with an attention grabbing, ambiguous torture scene, cleverly filmed to shroud the viewer from witnessing all the details of the violence. Questions will arise in the viewer’s mind as to what exactly is going on in the scene and just as the worst is about to happen to the unknown victim, the scene fades. An ominous “Day’s Earlier” title card appears on screen and the plot kicks into high gear. We are introduced to Lily and it is quickly established through flashbacks that her upbringing was anything but a wholesome, love-drenched experience that is often stereotypically associated with growing up in the Heartland of America. Instead, she was subjected to abuse in the name of religion by her fanatical mother, who makes Margaret White from Carrie look like Mother of the Year. Understandably, one day Lily snaps and kills her mother to escape the abuse. This action slowly takes its toll on her already fragile, bruised psyche. Instead of feeling relief, she drowns in depression and loneliness. However, her one saving grace is her friend from childhood, Roman. Roman still lives next door to Lily and often does odd jobs for her. Lily has always lusted for Roman, but her conflicted views about sexuality have resulted in awkward displays of affection. When Roman announces he is going to marry his girlfriend, Lily sinks deeper into a dark depression and loathing, ultimately taking the old cliché “if I can’t have him, no one can!” dangerously to heart. In spite of the extremely low production values, Roman’s Bride in genuinely a creepy, atmospheric, disturbing little film. Anne Paul’s performance starts off a tad shaky, but as the film progresses she envelopes herself into the character of Lily. Her mannerisms, facial expressions, and voice inflections all portray a woman deeply damaged, dangerously conflicted, and heartbreakingly isolated from reality. The other actors do well with their parts and look at act like real people. There is a naturalness to the performances not often seen in these types of films. The dialogue, for the most part, is crisp, concise, and believable, though there is one major flaw with the screenplay itself as the film reaches its climax. The violence portrayed in the film is handled extremely well, mainly because of the editing and cut-away of a shot at just the right time to allow the viewer to think he/she saw more than what was actually shown. The climax of the film comes fast and furious and the exact extent of Lily’s psychotic obsession is displayed. This is also where the film’s only real unrealistic moment happens; after escaping severe torture and witnessing a murder, Roman escapes. Does he run from the house screaming for help? Does he immediately call the police? Does he tell anyone what just happened? No. Instead, he goes home, takes a shower, and decides to return to the house he just escaped from. It’s one of the moments where you yell at the screen and roll your eyes and was really unnecessary in the context of the plot. Still, for a film made with virtually no budget and by first time filmmakers, this flaw is minor. Overall, Roman’s Bride is an unsettling glimpse and religious extremism and forced sexual repression coupled with an already delicate psyche. The low budget ultimately actually succeeds in creating a gritty atmosphere perfect for capturing the sometimes gritty isolation of rural life. In this aspect the film heavily reminded me of the early 70’s forgotten gem Let’s Scare Jessica to Death. Roman's Bride is a homage that works because of the commitment and obvious passion for the genre that the Paul's possess. Despite the tiny budget, for sheer effectiveness, it outdoes most big budget, theatrical released horror films from the last few years. It is the prime example of budget being meaningless if the story is engrossing and in the hands of a filmmaker and cast who have a true passion for the project.